Dog Boarding, Lodging and Training in Richmond, VA! Your Dog Deserves a Stay in the Country! Looking for a boarding kennel that isn’t one? A doggie daycare that breaks the mold? Training that leaves the cookie cutter behind? Grooming that your dog actually enjoys? In short, a place you can bring your four-legged family member with complete peace of mind? You’ve found it! A Stay in the Country Pet Lodge is a unique boarding, training and daycare facility where the safety and comfort of canine clients is the biggest priority. When it comes to dog boarding, daycare and training, we simply do more to make sure your dog is nurtured, engaged and active during the stay. At A Stay in the Country Pet Lodge, we recognize, celebrate, and accommodate each individual dog’s needs, and preferences. And we take just as good care of our human clients. If you’re looking for a pet-care facility that’s a bit different, you’ve found us. We can’t wait to show you around. A kennel that’s not a kennel, that’s how we think of ourselves. Our loving, professional staff and large, grass play yards make this Richmond’s most enjoyable dog boarding facility! Your dog can expect fun-filled days and cozy, clean kennels at night. Ready for peace of mind? No big, unsupervised groups here. Each daycare guest enjoys a supervised daily itinerary customized for their safety and enjoyment. Pre-daycare evaluations, careful introductions and small, supervised play groups, mean you can relax and your dog can have fun. Is your dog ready to play? We designed our Day School and Lodge and Train programs with busy clients in mind. A well-behaved dog becomes a positive addition to your family. We’d love to help bring harmony to your household with our easy approach to training. Ready for change? A puppy’s social experiences play a huge role in how friendly, patient and good-natured they will become as they mature into adult dogs. That’s why we have created a special program, Just for Puppies. Ready for puppy raising relief? Shiny coats. Trimmed nails. Clean ears. All accomplished with gentle, patient handling. 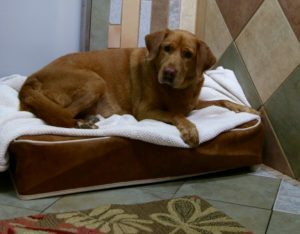 We want your dogs to enjoy their time staying with us, even when its bath or nail trimming time! Ready for a happy, clean pet? A great way to get to know us a bit better! 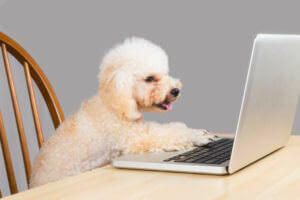 Find expert opinions and interesting news about all things dog—care, behavior, the funny moments and the poignant ones. We also post some pretty great pictures, too. Ready to take a look? Activity and Play are Important. That’s why Our Guests Play Every day! We don’t warehouse our canine clients. We are an activity-based pet care facility because we understand that playtime and activity is very beneficial for dogs. We want you both to experience the happiness and contentment that leads to your pet’s reduced stress, good behavior and better sleep. We want to help you build your dog’s confidence and keep him agile and healthy. That’s why we fill their days with personal one-on-one attention, mental stimulation and social play with carefully chosen dog companions! Learn more about our dog lodging activity packages here! Your dog’s safety is your biggest priority and it’s ours as well. 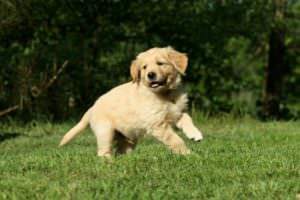 All of A Stay in the Country Pet Lodge’s services are built around our professional experience and education in dog behavior and a personal commitment to the Off-Leash Play Pet Center Safety Pledge. As part of that pledge, we proudly commit that our programs have been designed for the safety of all dogs. We strive to ensure the physical safety of each dog and our goal is for each one to go home from our center behaviorally and emotionally better than when they arrived. 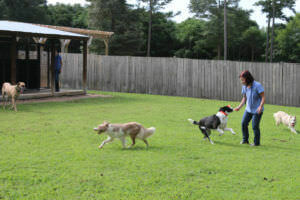 Requiring staff members to be physically present at all times when dogs are in play groups. Read the entire safety pledge, here. A Stay in the Country Pet Lodge is your partner for boarding, daycare, grooming and dog training in Richmond. You can trust that your dog’s safety is always our biggest concern, and that each day he or she spends with us will be filled with activity and affection. If you have any questions about any of our services, please contact us or email us, today. It would be our pleasure to show you around the facility and help you plan your dog’s visit. 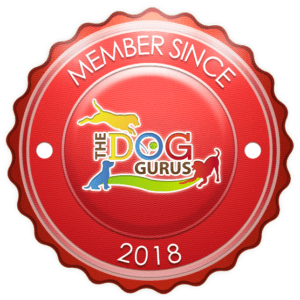 To hear from people who have lodged or trained their dogs with us, please see our testimonials.